Standing in the middle of one of the world’s largest shopping malls, I couldn’t help but shiver. Not because I was overwhelmed by the 520 stores than make up Dubai’s Mall of the Emirates—although they were quite jaw dropping—and not because the centre welcomed more than 33 million visitors in 2012. I was shivering because it was minus three degrees and I was standing in a snow park. In the middle of the desert. Chilling out in the -3 degree temperature at Ski Dubai. 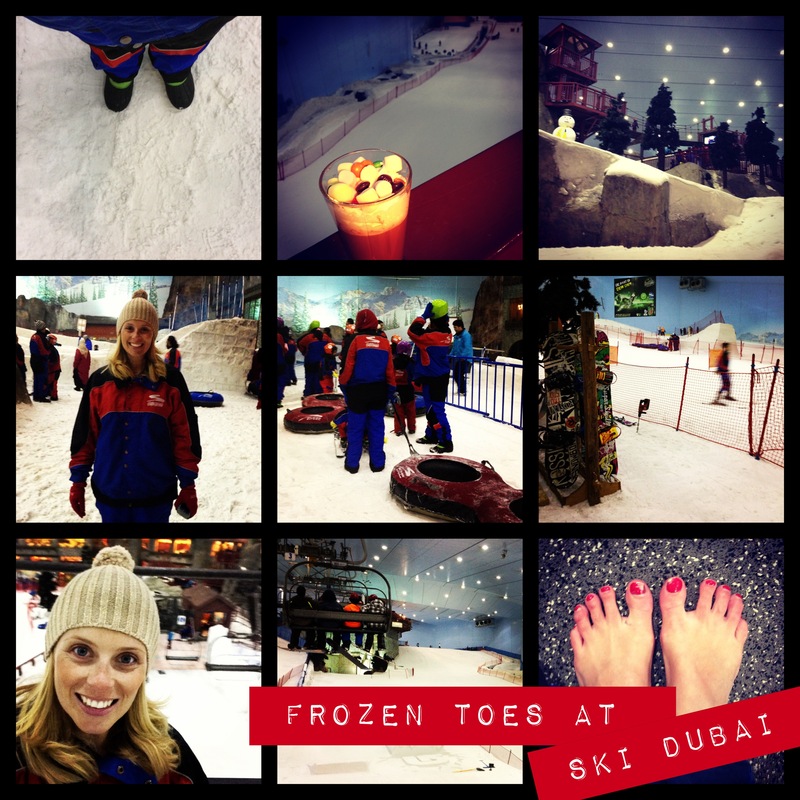 As the sun beat down on the dusty streets of Dubai, I pulled a ski suit on over my jeans and t-shirt and headed into the all-year-round winter wonderland of Ski Dubai. Covering more than 22,000 square metres, Ski Dubai is the Middle East’s first indoor ski resort and it’s jaw-dropping. 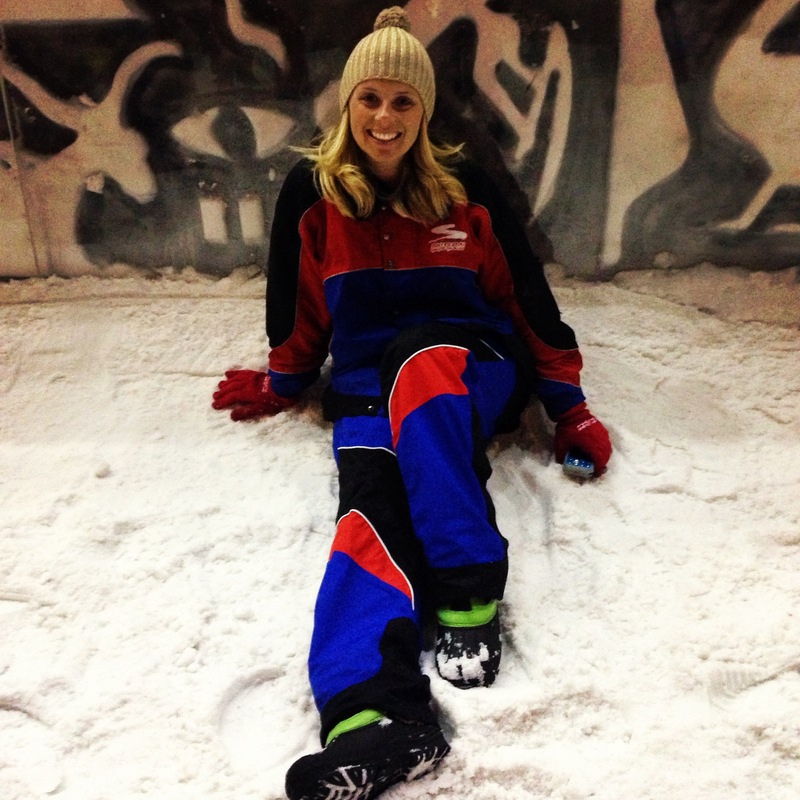 As well as being home to five ski runs reaching as high as 85 metres (25 stories) and 400 metres long and a 3000 square metre snow park, Ski Dubai has real snow. And real penguins. It also maintains a temperature of between -2C and -4C … which makes it the kind of cold that turns your toes and fingers pink and leaves you yearning for a hot chocolate, a hot shower and the hot streets outside. Despite the already chilly temperature, things were about to get a whole lot cooler for me as I signed up for Ski Dubai’s Peng-Friend encounter (AED 145 per person). 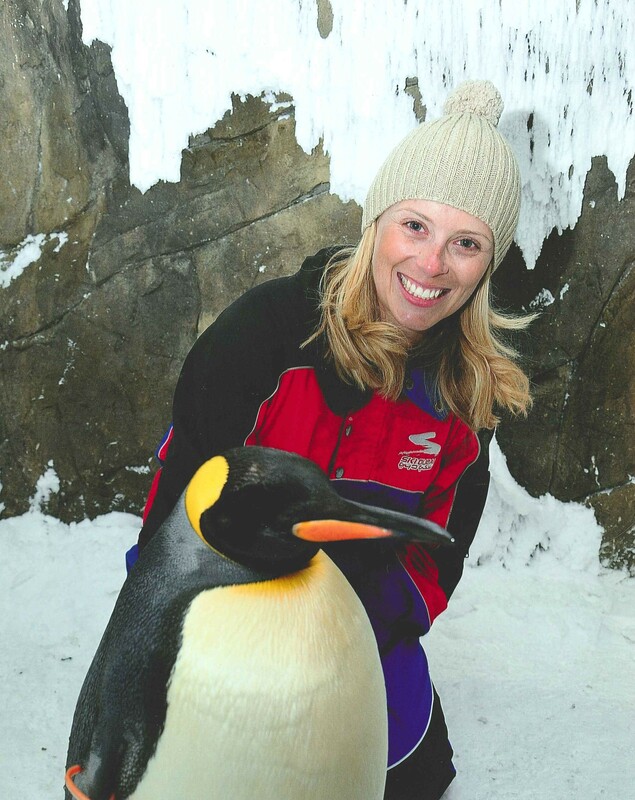 As part of the 40 minute encounter, I had the chance to have an underwater viewing of the penguins in their private pool and meet three of the snow penguins. 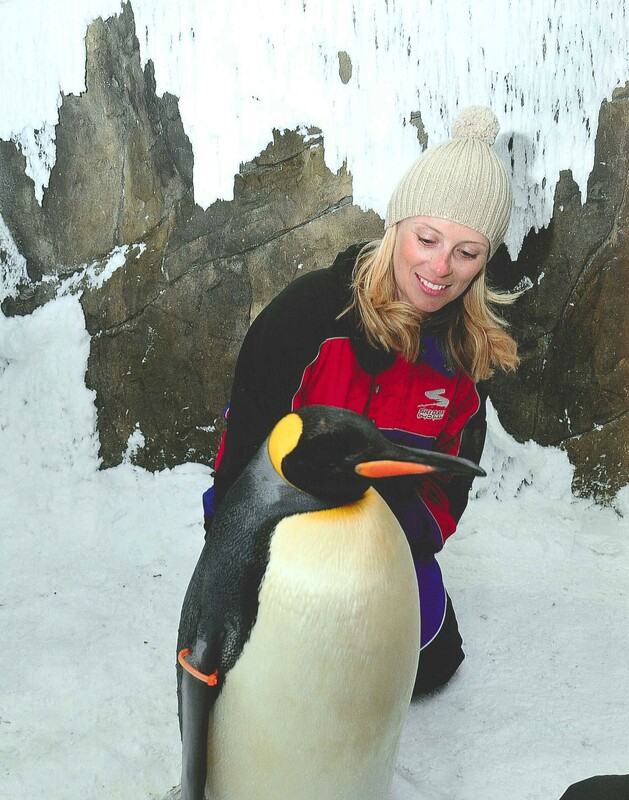 Hanging out with Pebbles the Gentoo Penguin. Born far across the ocean at SeaWorld San Antonio in Texas, the colony of 10 King and 10 Gentoo penguins (the second and third largest penguins respectively) moved into Ski Dubai at the start of 2012. Their ice-cave ‘home’ features a private pool, a top deck area with rocks, and a holding area as well as a kitchen fully equipped to provide daily fish banquets (each penguins eats one to two kilos of fish a day) and a hospital. 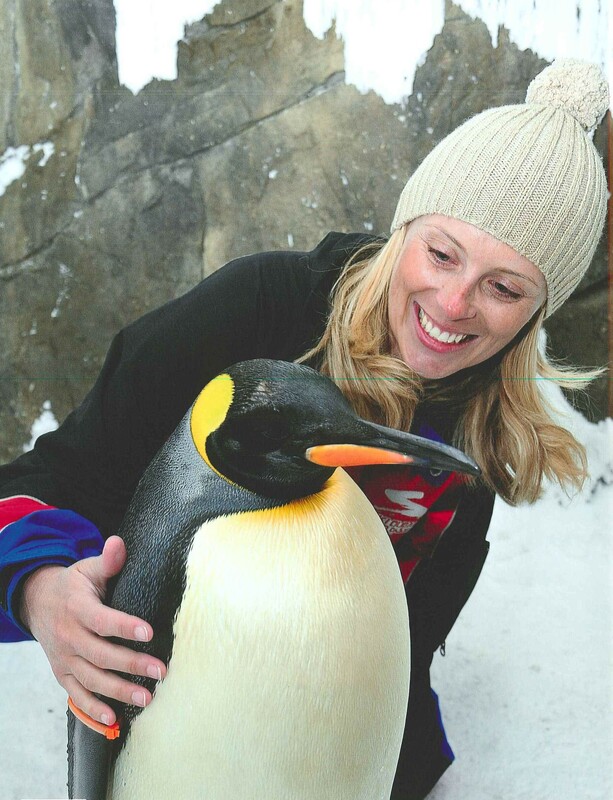 As part of my visit, we met two Gentoo penguins including Pebbles, a two-year-old penguin who has already found her mate and Squeaky, and a King penguin, Squeaky, who had just taken a dip in the –9C pool before our visit. Much like the family dog, penguins love being around people and will take to following you around looking for attention. As one of the trainers took us through the penguins backgrounds, Pebbles (above) amused herself with a squeaky toy before jumping onto some nearby seating to pose for photos. We then moved enclosures to meet Squeaky. While the Gentoo penguins are not yet able to be touched, Squeaky was more than happy to be the center of attention, standing still for a pat, a hug and a photo opportunity. How to hug a penguin. 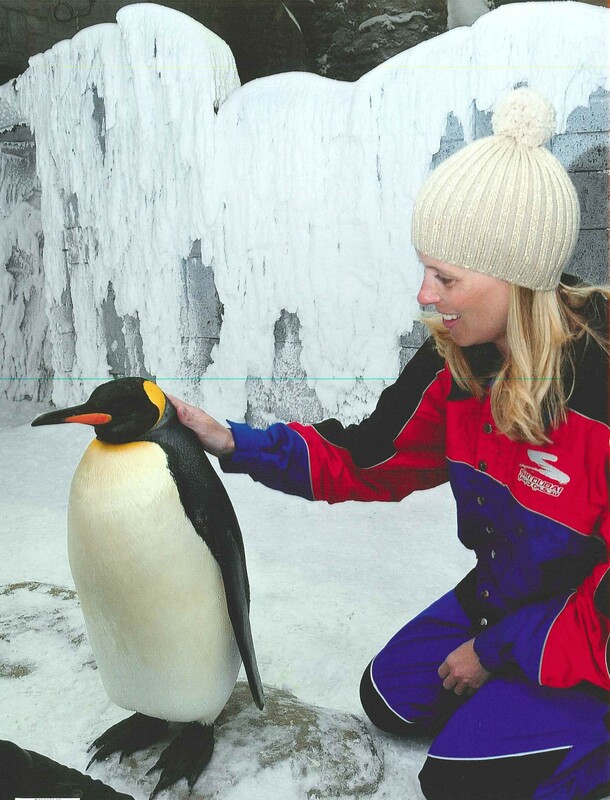 Meeting Squeaky the King Penguin at Ski Dubai in the Mall of the Emirates. Having always had a soft spot for penguins, I expected I’d love the encounter but I can honestly say my somewhat frozen heart was thawed as I watched the little guys waddle around. Although cameras cannot be taken into the encounter, a Ski Dubai photographer was on hand to capture any special moments, with the photos available for purchase (which clearly I did!). For those who don’t fancy a close up meeting, the colony is also taken on a March of the Penguins through Ski Dubai once a day. With my penguin encounter over, I headed up the slopes for a hot chocolate (topped with m&ms and marshmallows… hello!) and then dropped myself into a tube and flung myself back down the slope. With my adventure over—and my toes numb—I decided to farewell Ski Dubai and hot-foot it back into the heat and warmth of the mall for a spot of shopping! 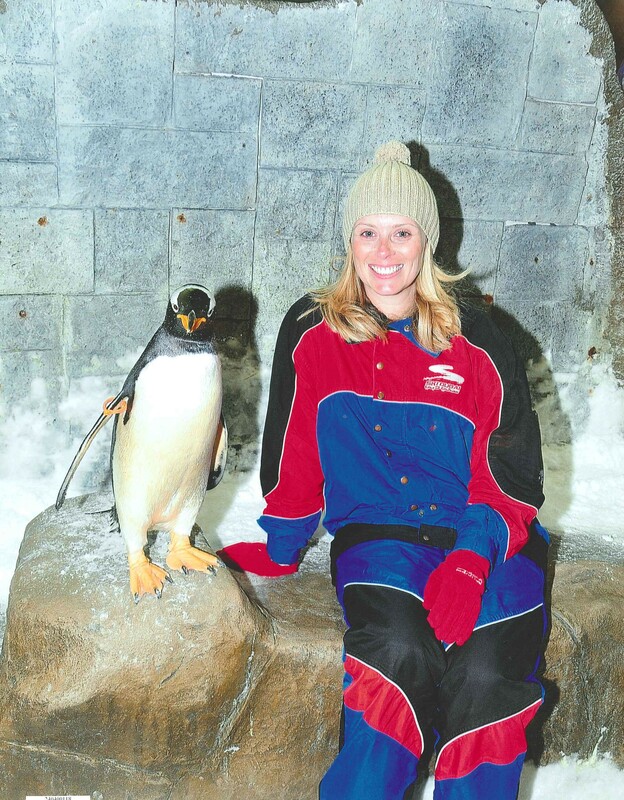 I would highly recommend a visit to Ski Dubai, and an encounter with my new penguin friends, for anyone holidaying—or stopping over—in Dubai. Thanks Rach! I think I’d like one as a pet!